It is Monday and I am back at work after a wonderful week away from Chicago in Southern California (Oceanside, to be exact). Between Orange County and San Diego lay a bunch of small, cute, charming beachside towns, and I was lucky enough to get to stay on the beach for the entire week. Besides the beautiful beaches, charming shops, palm trees and plentiful pools, this area is FULL of microbreweries! This was great news for my family and me as we all enjoy trying new beers and supporting local breweries. Right in Oceanside are several breweries, but we only visited one: Bagby Beer Company. It is off of the main road in Oceanside and I thought it was HUMONGOUS for a micro brew pub. There were several areas for seating: the inside bar, a tasting room, a large back patio, a large upstairs deck and an upstairs bar. We went for lunch one afternoon (I highly recommend the burger) and another night for a post-dinner beer. Their best beer that I tasted was "Pesky Neighbor" an IPA but I also liked "Struggle Bus", a nitro IPA. They have 25 (!) of their own beers on tap, as well as many other local brews and a few bottles. All of the servers definitely knew their stuff and it sounded like most of them homebrewed as well. Bagby is definitely a place I'd recommend for food, as well as for spending an afternoon tasting as many of their beers as possible! It also seems like it would be a great place for a party, especially on that upstairs deck. And considering that weather in Oceanside seems beautiful 85% of the time, you probably wouldn't have to worry much about rain outs. In Solana Beach, another cute little beach town, is Culture Brewing. My parents stumbled upon this brewery (they have knack for that) on the first day it was open. It is MUCH smaller than Bagby and consists of the main bar area (with no seating, I guess because of licensing laws?) and the back patio. I only tried one beer here, their Mosaic IPA, and it was VERY good and "low gluten" (meaning it has 10ppm of gluten or less). Half of the beers on their list were low gluten, so if you're sensitive to gluten but not celiac, I'd recommend this place to fill up your growler. Hopefully one day they will have more seating to encourage people to hang around and drink for a while. you can see the brewing equipment from the patio! Finally, there is a small chain of pizza/brewpubs in the area called Pizza Port. We went to the one in Carlsbad on Friday night and it was BUSY! Luckily we snagged a spot at the bar; it is kind of first come, first serve seating, with no hosts/servers (you order at the counter and they call your name when your food is ready). The pizza was DELICIOUS and I would tell you to order the beer buddies (basically garlic pizza crust with dipping sauces) for an appetizer while you wait for your pizzas to be done. Since this is a pizza place as well as a brewpub the crowd was more mixed with lots of families, little kids, teenagers, etc. I had the "Off the Chain" double IPA which reminded me of some of my favorite double IPAs and the "Grapefruit Puncher" IPA which had just the teeniest hint of grapefruit. They had a LOT of their owns beers on tap (also available in pitchers) and many others as well. Pizza Port offers cans and kegs of their beers to go, and we saw their beer cans in the grocery stores we went to while in the area. If you're ever visiting the area, definitely research the local microbreweries! Hopefully I'll get to back again and check out the ones I didn't have a chance to see. There is more to Oceanside than the beaches! Over the weekend, I discovered the beer that I didn't know my life was missing. I was on my way to a housewarming party, and knowing I shouldn't show up empty handed (I'm always a thoughtful guest), I stopped by a liquor store. With my boyfriend in tow, who was pathetically hungover, I decided not to go with my usual choice of an IPA. Not only because I was thinking he might improve and want a lighter beer to drink, but also because I took his condition as a warning sign and didn't want to be like him the next day. As I perused the large selection of wheat and fruit beers, I noticed a watermelon wheat beer. I'm not the biggest fan of watermelon, or watermelon flavored things, but I was feeling adventurous and decided to take a chance - I'm glad I did. 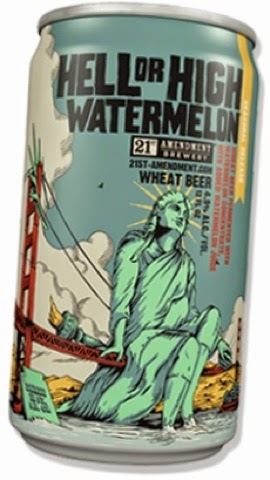 I ended up buying the Hell or High Watermelon Wheat Beer by 21st Amendment Brewery. The man at the liquor store checkout (who was probably one of the friendliest liquor store workers - if not humans - that I have ever encountered) told me that the 21st Amendment Brewery, located in San Francisco, just recently started distributing in the Chicago region and they were having a hard time keeping their beers in stock. According to him, they had been told that the watermelon beer would be the most popular and were advised to order more of this as it would fly off the shelves. (Correct advice). While, I'm generally a fan of hoppier, more bitter IPAs, I absolutely loved this beer and probably drank most of the six-pack. It wasn't just a beer with a hint of watermelon, but the watermelon taste was very prevalent and fruity without being too sweet. It still tasted like beer, but I think that even non-beer drinkers would find it pleasant. The beer also gets points for its lovely can design. You should definitely check this beer out - if you can find it! I'm looking forward to trying more 21st Amendment beers. I'll probably spend most of the summer outside drinking Hell or High Watermelon waiting for someone to open a 19th Amendment themed brewery. 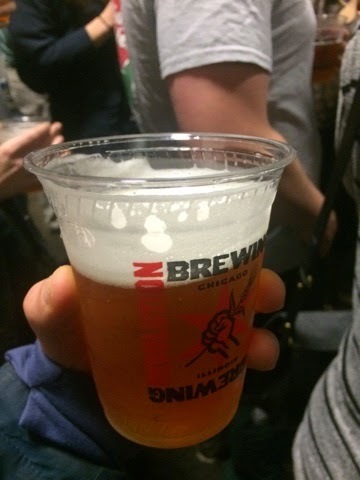 Last week, a few of my friends and I took a tour of Revolution Brewery through the Notre Dame Alumni Club of Chicago. Not to be confused with the Revolution Brewpub in Logan Square which has delicious food so go there, the actual brewery is located in the Kennedy Planned Manufacturing District (I didn't know this was an actual area, either). I'm not exaggerating when I say that it's taken me years to take this tour. After a failed attempt two years ago to both find the location, and then once we found it, to get a spot on one of the coveted tours, I've been trying to make another trip. Thinking everyone would have romantic dinner plans, I thought it would be a good idea to go during the afternoon this past Valentine's Day. Apparently, I'm not as clever as I think and everyone else in the city had the same idea. It was super crowded and there was a 4 hour wait for the next tour! (Sidenote: parents, if you're going to go to a brewery on Valentine's Day, maybe leave the kids at home?). I had given up hope of ever going on a tour of Revolution, so when I received an email from the ND Club of Chicago saying that they had spots on a tour for young alumni, I immediately signed up. I've probably been on at least a dozen or so brewery tours at this point, but since I drink Revolution beers a lot, I was excited to go on this one. But - spoiler alert - this tour was almost exactly like all the other brewery tours I've been on! Which wasn't necessarily a bad thing. I know to expect learning about the process through which beer is made (typical) but then we also got to learn about Revolution specific items - such as the history of the brewery, their production/distribution, their designs, etc. I won't get into any specifics - instead go on the tour to learn more. 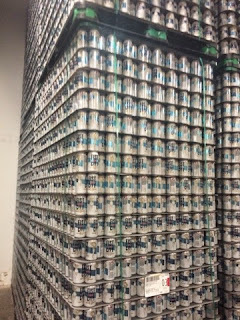 My favorite parts of the tour: getting 1.5 free samples of beer, free popcorn and getting to see all of the cans stored in the brewery. I also got to try Fist City - a pale ale that tastes really hoppy - for the first time, which might be my new favorite Revolution beer. 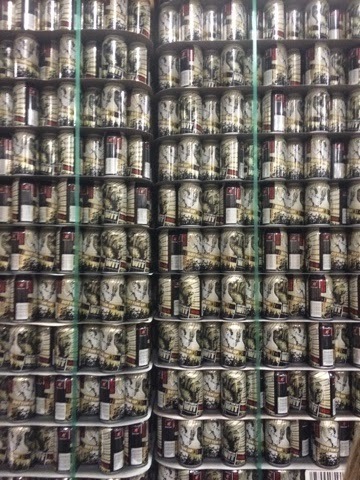 It's being distributed in cans now, so you can all try it for yourselves - as long as you live in the Chicago region! My least favorite parts of the tour: having to wear safety glasses on the tour (surprisingly not fashion forward) and trying to get to the brewery itself, as it's in a location not convenient to public transport. Although it took me almost 3 years of living in Chicago to go on this tour, I would definitely suggest taking a trip. The tour is free and the beer is great - just make sure you plan ahead or get to the brewery early to make sure you get a spot! Last week I had the pleasure of dining out with my family for my mom's birthday. My parents moved into the city a couple of years ago and have definitely taken advantage of the restaurant scene here. They love trying new places and my mom enjoys researching where they should go next. 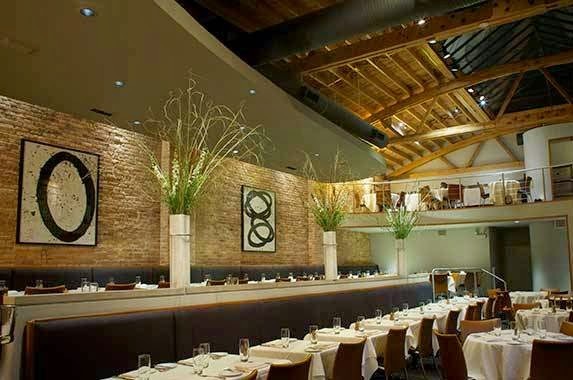 For her birthday dinner she did a lot of research and decided she wanted to go to mk in River West, named one of Chicago's 50 best restaurants by Zagat (it was #15!). I hadn't heard of mk previously, but after we ate there I'm not surprised I hadn't heard of it. It is in kind of an out of the way neighborhood--just outside of River North, just south of the Gold Coast, not quite in the West Loop. It is also pretty pricey and since I rarely go out for fancy dinners if I have to pay, this was probably why I didn't know of this place. Having said that though, I would DEFINITELY like to go back there as soon as I get a sugar daddy, or maybe for my own birthday this year. I'm not exaggerating when I tell you that this place was REAL good. My mom said it might have been one of the best meals of her life. I'm no food critic, but I had to agree with her. My parents and I arrived together and while we waited for my younger brother to show up we sat in the bar area and had a cocktail. I ordered the "sweet sixteen" and was informed by our very handsome and smooth talking bartender, Nico, that the drink is named that because the restaurant is celebrating its 16th year of being open. This drink was great and I would definitely order it again (my brother got it as well): Ceres' vodka (shout out to Chicago Distilling! ), lavender syrup and elderflower liquer. It wasn't sweet, but very smooth and delicious. Once we were seated we decided to start with some appetizers. We ordered the grilled octopus and the two tartares. This grilled octopus was my favorite thing (possibly in the world). It was char-grilled, but the waiter (who has worked there since the beginning!) says that the chef cooks the octopus in wine, vegetables and seasonings and WINE CORKS (which somehow take the rubber-iness out of the octopus? or maybe just for magic?) before grilling. I'm not a big raw fish person but that the salmon tartar with avocado puree was pretty good (the one bite I was able to steal from my mom). When it came time to order our entree I was torn between the duck and the chicken. I chose the duck and I'm VERY glad I did. It was probably the best duck I've ever had. My mom had the chicken, my brother the steak (I had a bite and it was great!) and my dad had the white fish and lobster. Everyone loved their choices. mk has a very extensive/EXPENSIVE wine list. I stuck with just the one cocktail but my mom, the family wine expert, ordered a bottle of red for the rest of them. They were happy with their choice. My mom had the s'mores dessert and I think she ended up eating most of my dad's chocolate cake because she is a chocolate fiend. While the decor at mk isn't as fancy/interesting as some of the newer and trendier restaurants in town, it is worth a visit just for the food. I seriously think it could be one of those dining in the dark places and no one would complain--that's how good it was. A good place to make a reservation at for when your parents are visiting or you have something special to celebrate! Once upon a time, a few years ago, a man was returning to his home after a long bike ride. As he rode along the country road and into the small town of Sawyer, Michigan, he saw a previously vacant building bustling with activity. When he rode up to the entrance he saw a young couple and asked what was going on. They told him they were opening a brewery on this spot (previously a combination laundromat-sandwich shop-video rental shop, I KID YOU NOT) and that it would be opening soon. The man looked in wonder at all of the brewing equipment and promised the couple he would return. That man was my father. 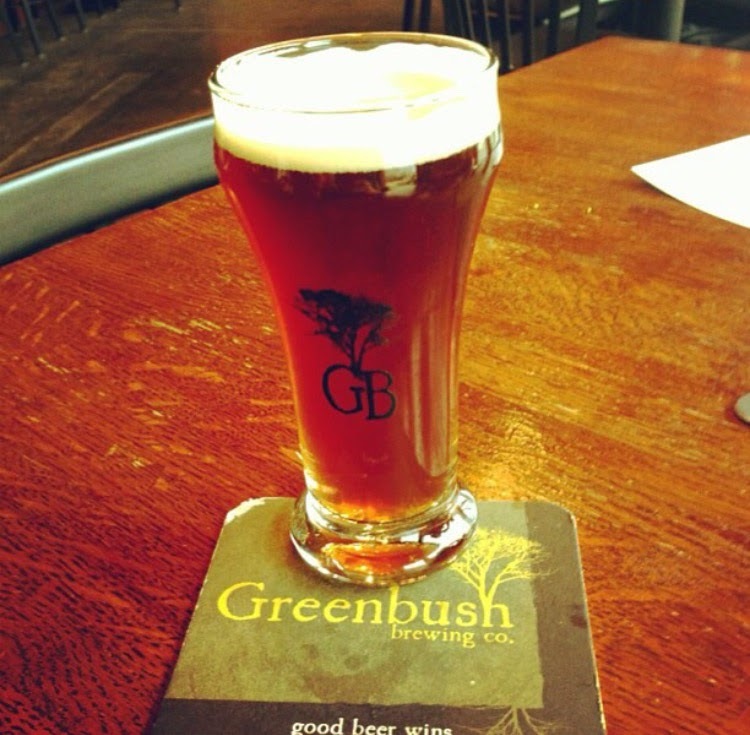 Lucky for me, and for all of you, that brewery was Greenbush Brewing Company. It opened in 2011 in Sawyer, a small town part of "Harbor Country" the area of southwestern Michigan frequented by Chicagoland escapees due to its quaint small towns and vast beaches along the Lake Michigan coast. My family has had a house in Sawyer since I was in high school, so I've been fortunate enough to spend most of each summer there (I even worked as a waitress/bar back for 2 summers in college at a small restaurant there!). There isn't much going on in "downtown" Sawyer, except for the popular Sawyer Garden Center, where you can probably find almost anything you'd ever want, but most famous for its fresh fruits and vegetables. Greenbush has reinvigorated the Sawyer economy, providing a LOT of jobs and bringing in the crowds that I'm sure end up spending money all around the area. In fact, the surrounding area has become a recent hot spot for new breweries, including Round Barn, Tapistry, and the soon to be open Haymarket (sister to this one). It makes perfect sense to me; what is better after a day at the beach than a cold, fresh beer? Or if the weather is bad, there isn't a whole lot else to do in the area besides antiquing, so why not spend the afternoon drinking/eating? But back to Greenbush; this place has expanded significantly since it first opened. 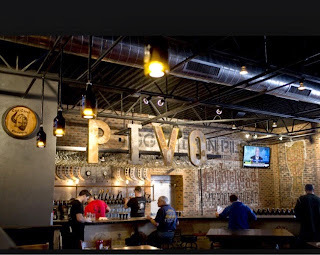 Their beer is available all over the Midwest (on tap and by the bottle). The taproom is ALWAYS crowded (at least on the weekends) and the wait for a table is usually at least an hour. Luckily if you're waiting, you can head over to the newly expanded Greenbush Annex, just across the street and have a beer, shop their extensive merchandise, snack on some meats and cheeses and even play bocce ball. The taproom has expanded a couple of times to make room for more tables and so has the outdoor patio. The draw of Greenbush is definitely the beer (it is SERIOUSLY high quality, some of the best beers I've ever had), but it doesn't end there. They have a great and friendly staff and they also have...BBQ. Their brisket and pulled pork is some of the best my family and I have ever tasted, and that is saying something since my dad is obsessed with BBQ. You wouldn't expect a place so focused on beer to have such good food, but they do. My favorite things on the menu are the brisket (OBVI), the turkey bacon melt, and the cubano. When you first sit down at the bar, definitely get the pretzels with pub cheese to have with your first beer. 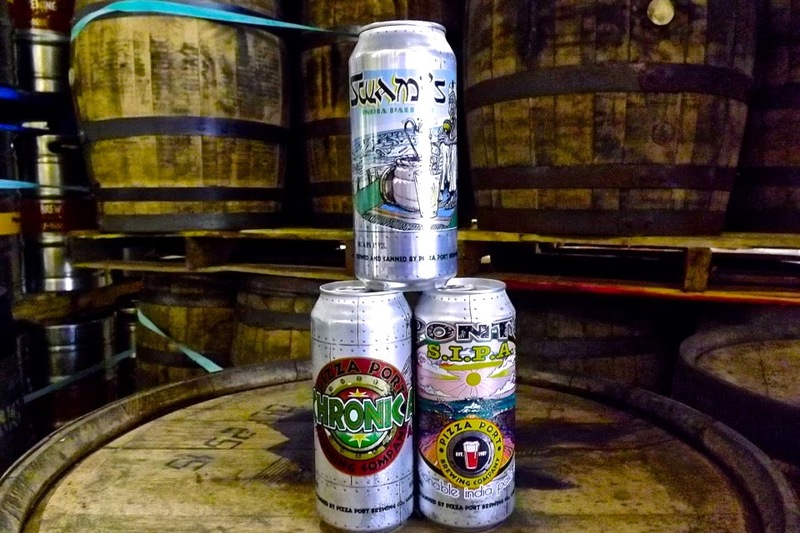 All of their beers are at least 6% alcohol by volume, and I'd say on average, they are usually 7-9%. My mom's favorite, Brother Benjamin, a double IPA is 10%. The 9% and above beers are usually only served in 10 oz snifters. The rest of the beers can be served in a pint glass, a growler, or for the lucky few a MUG. Greenbush's mug club is a great deal if you know you will be visiting often. For $60 you can join the club, which means you get a mug with a number attached to it. When you order your beer you get poured in a mug for the price of a pint, so you're just saving money...plus they have specials throughout the week for mug club members only. Sadly, I didn't join the club right away, so I'm in the 2000's, but my dad is proudly around 150. My favorite of their beers as of late have been: Middle Finger of Buddha (a Belgian strong IPA), Indispensable (an IPA), Vanderbush (a beer made with apple cider). 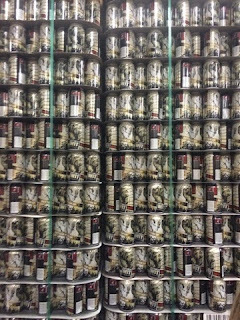 Their original summertime beer, Sunspot is coming out in the next few weeks, which will officially mark the beginning of what should be warm weather. Another great thing about their beer is that you can get most of them for $4-6.50/pour, which is significantly cheaper than beers of their quality would be at a bar in Chicago. 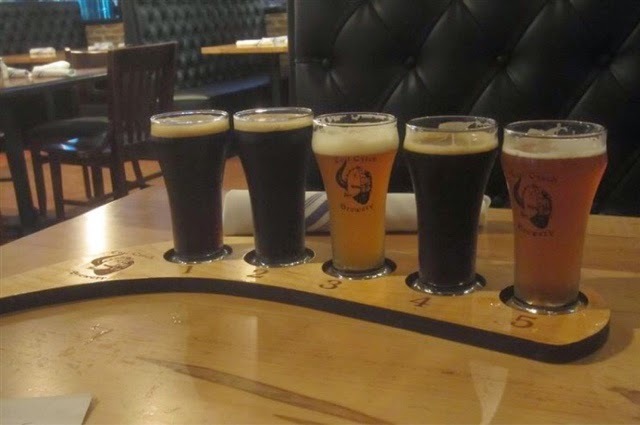 So if you're ever in the area (antiquing, visiting the Warren Dunes, getting a burger at Redamak's), you should definitely stop by Greenbush and consider getting a flight of their beers; better to try a bunch! Obviously you all know that I like to drink beer--all kinds and often. So last year Caitlin and another friend decided I should learn how to make my own beer and got me the Brooklyn Brew Kit (~$40) for Christmas. I FINALLY got around to starting the brewery process on my Everyday IPA (the malted barley blend, yeast and hop combo included in my kit) and wanted to share the process so far. First of all, when I first got this kit I thought I'd be able to go from the beginning to enjoying a nice cold beer in a day or two. It actually takes about a month from starting to brew to drinking your brew. This is important to keep in mind when planning when you will brew, bottle and consume. Secondly, I was not exactly prepared equipment-wise...the kit includes everything that you'll need EXCEPT a fine-mesh strainer, funnel and the pots you'll need while brewing. I figured the one large pot I had would work, but if I do this again I will be purchasing a SECOND large pot and a MUCH LARGER strainer (this is the 8" diameter strainer I used; I'd recommend a strainer that is as wide as your pot DUH). For those who haven't been on as many brewery tours as us, let me give you a quick lesson in beer making. There are 4 main ingredients in beer: WATER (duh), hops, yeast (for the ah-ah-ah-alcohol) and a grain mixture (usually includes malted barley). You add the grain to VERY HOT water, let it soften all the sugars out (this is not a scientific explanation), strain out the grain (there is a brewery limerick in here somewhere), heat up that sugary water some more while adding hops, cool it all down, strain it again into your fermenting apparatus, add the yeast and SHAKE IT UP. 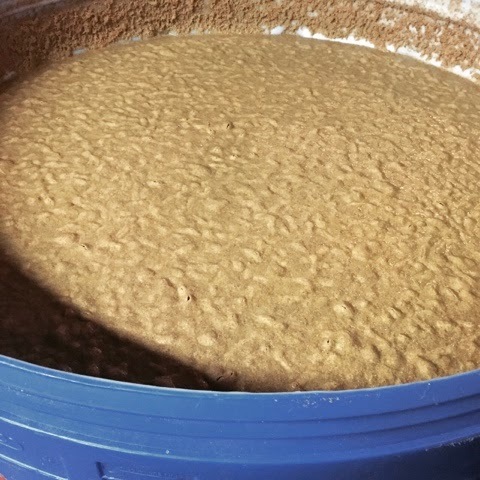 Then the yeast eats up all the sugars, pooping out alcohol and carbon dioxide (YUM!). That is the basic jist of how you make beer (all expert brewers shaking in horror now). This whole process is a lot more time consuming than I'd anticipated as I mentioned, and also a lot more stressful. It is VERY important to sanitize everything that will be touching anything related to the ingredients (still hoping I didn't mess this part up!) and to keep the temperature at certain levels throughout the entire heating and then cooling process. That long glass thermometer will become the nagging watchman of your kitchen while brewing. The worst part of all of this is that I won't know if I screwed anything up until I finally tasted my beer, and if this happens I will probably cry. All in all it took me about 4-5 hours for the first part of my beer brewing. I did it on a Saturday afternoon while rocking out alone in my tiny studio kitchen. Once the yeast was "pitched in" (real brewing term!) to my glass fermenting jug, I allowed the beer to ferment for about 3 days, then put a stopper on the jug. It is currently sitting on the floor of my front closet, waiting to be bottled this weekend. Stay tuned for the next installment of "Adventures in Home Brewing", where we find out how difficult bottling is, if my beer ended up being any good, and whether or not I will try this whole thing again! 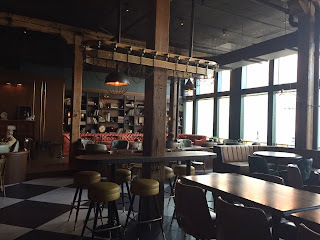 Despite working in the West Loop, I really haven't had an opportunity to try out all the new bars and restaurants that seem to be constantly popping up. So I was excited when Alyssa suggested that we get drinks at The Betty after work on Tuesday. The Betty is a new cocktail bar on Fulton Market. The Betty made a good first impression with its decor - although I'm not sure that I enjoyed the curtained entryway (I felt like I was walking into a private event). 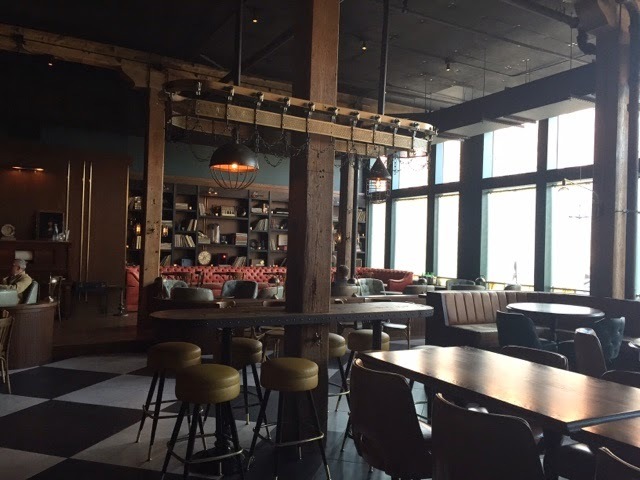 The space definitely has an old-fashioned, retro vibe and is complete with a player piano! While we happened to be there on one of the rare warm days this spring, the bookshelves and leather couches suggest it would be a cozy place to get a drink when the weather is less hospitable. While I've been a little turned off gin since our trip to Chicago Distilling (The Betty has a G&T option with Finn's Gin), the cocktail list had plenty of other options. I decided to try the Maximillion - a tequila based cocktail with ancho chile liquer, hibiscus syrup, mole bitters and sparkling wine. I was definitely not disappointed in my choice and probably would have had another had it not been for my empty stomach! 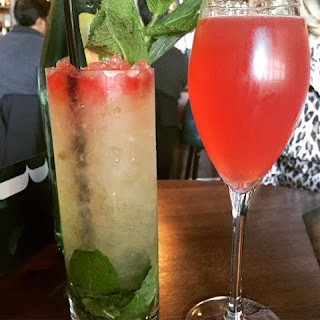 Alyssa tried Le Grand Dame - a cocktail with gin, bitters, mint, lemon and grenadine. A lot of others were ordering this, too, so I imagine it is a good seasonal drink choice. The Betty also has a selection of food - small and shared plates. We didn't have any, but it all sounded good and probably is, as the head chef is from Avec. The Betty would be the perfect place to bring a date (or have an after work lady date). I'd definitely go back to try some of their other cocktails, but, hopefully, I'll also get the chance to try out some of the other West Loop bars soon. 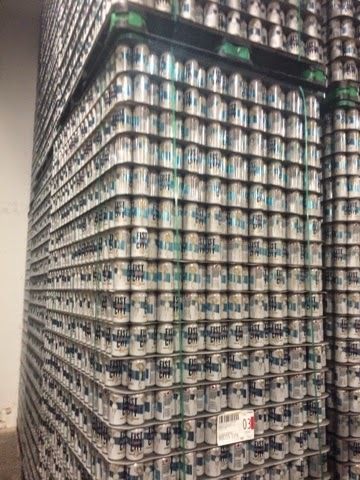 As you know, we really enjoy beer around here. We especially like trying new beers. BUT how are you supposed to do keep track of all these beers? And how do you know if you've already tried a beer and whether or not you actually liked it? Enter UNTAPPD. This app (for iPhone and Android) is a social beer tracker. I've been using it for a couple of years and have found it a fun way to keep track of beers you like (or a way to remember which beers to steer clear from in the future!) and a way to find out about new and trending beers. 1. Create a profile (you can also use Facebook or Twitter, but I don't like linking all those things so I created a separate Untappd profile). 2. Start checking in beers! When you check in a beer you can search by the beer's name or the brewery. When you find the beer you're looking for you can rate it on a scale of 5 stars (and it allows 0.5 point ratings), make comments, check in the location of where you're drinking the beer and even take a picture to save with your check in. 3. Earn badges. You can earn badges based on how many of a particular kind of beer you drink, drinking a number of a beers in a certain amount of time or at a certain location on a certain day, etc. I currently have 140 beers. My favorite badges are the ones that tell you how many different kinds of a certain beer you've had and what "level" you're at. For these badges you go up a level after every 5 beers. For example, I am on level 48 of the "Land of the Free" badge (for drinking 240 different beers made in the USA). 4. Follow your friends and fellow beer connoisseurs. This is where the social component comes in. You can "friend" people on Untappd and then their check ins will show up in your feed. I like this feature because I can see what my friends are drinking and when they are drinking beer WITHOUT ME (just kidding...). If you find a random person that has similar tastes to you, by following them you may discover beers you haven't heard of yet and get ideas on what to try next. There are other features on Untappd that can show you what beers are popular near you, or even where to find a particular kind of beer. I don't use these as much, but they would certainly come in handy when you are looking for a rare beer or have a craving for something really specific. Join us on Untappd! My user name is alyssajank and Caitlin's is Baitlo. Do any of you use Untappd, or something similar to keep track of which beers you've tried? Mondays can be rough: you're back at work after too short of a weekend, so they always seems extra long and terrible. One way to make these days better is to have something to look forward to for after work. 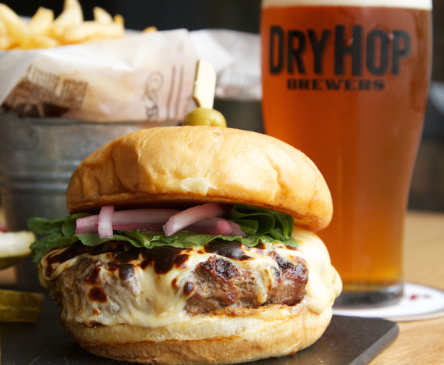 DryHop in Lakeview offers the "Barman's Banquet": a cheeseburger, pint of beer, and shot of bourbon for $15. The Barman's Banquet is my new favorite thing and luckily I live only blocks from DryHop. First of all, DryHop brews their own beer and it is DELICIOUS. Every time I've been there they've had something new on the menu, but sadly they only serve their beer on site. You CAN get it to go in growlers or giant 32 oz cans, but the best way to drink it is to drink it while you're sitting down to a delicious meal. All of the beers I've had from DryHop have been pretty hoppy and they like experimenting with new flavors. On this particular visit I had Fearless Vampire Killer, a Belgian IPA with lemon and COCONUT (?) flavors. I think it would be a great spring beer (which we may experience some time in April, if we're lucky). I also tried Too Many Puppies (the cutest beer name I've ever heard), a nitro lactose IPA. I had previously thought that only stouts and porters could be nitro, but apparently those are just more common because they usually work better with nitro as opposed to other kinds of beers. But the DryHop nitro IPA was VERY creamy and had great mouthfeel (so much fun to say) and I'm definitely going to be on the lookout for other nitro IPAs. look at that creamy head! The second type of liquid included in the Barman's Banquet is the bourbon. I'm not much of a bourbon/whiskey drinker (unlike Caitlin), but I can appreciate it in small doses, which made a shot the right size for me. On this particular Monday night they served Buffalo Trace shots. I drank it in 2 large sips but my boyfriend shot it like a man. Lastly, the CHEESEBURGER. All of the food I've had from DryHop has been great but I think the burger may the best thing on the menu. It was named to Thrillist's Best Burgers of 2013 IN THE COUNTRY, so you know it has to be good. You can add an egg or bacon to it, which I'm sure would make it even better, but it doesn't even need that extra flavor. I KNOW I will be hitting up the Barman's Banquet again soon, but DryHop is enjoyable any day of the week. If you like craft beer and good food, you'll love it. After the distillery tour on Friday, Alyssa and I were hungry and knew we had to find food before one of us (me) had a meltdown. 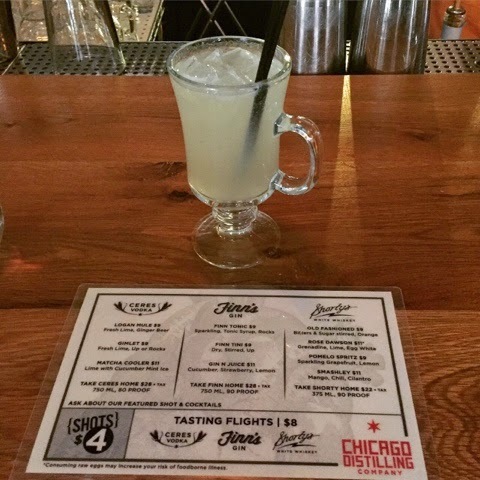 Thankfully, Chicago Distilling Company is located in an area of Logan Square with a lot of food options. We decided to take a short walk and eat at The Rocking Horse, where we did not have to wait at all for a table - on a Friday night! I had been here before, but since it's been a few years only had vague recollections that it was good. Since I don't drink liquor that often, the first thing that we needed was beer to cleanse our palates. We both started with the Sierra Nevada Beer Camp Hoppy Lager - It was my first time trying it and it was perfect for my hoppy preferences and getting rid of the white whiskey taste. Alyssa also had the Summit Saga IPA, which I've also had - we both approve! While the beer was good, I think the main highlight for us was the food. We started with the pretzel, which was a hit except for the extremely spicy mustard that came with it. Every time we took a bite, our sinuses felt like they were on fire! I also had the turkey bacon sandwich, which was everything I wanted after the distillery tour. I don't know if it was an off night, but the tater tots that I chose as a side were SUPER salty. So much so, that I think I suffered from a salt hangover the next day. Alyssa had the pressed Italian sandwich, which she raved about and also the white truffle fries (I would go back just to eat these). If you're ever in the neighborhood or looking for somewhere to eat after a trip to the Chicago Distilling Company, we would recommend Rocking Horse. 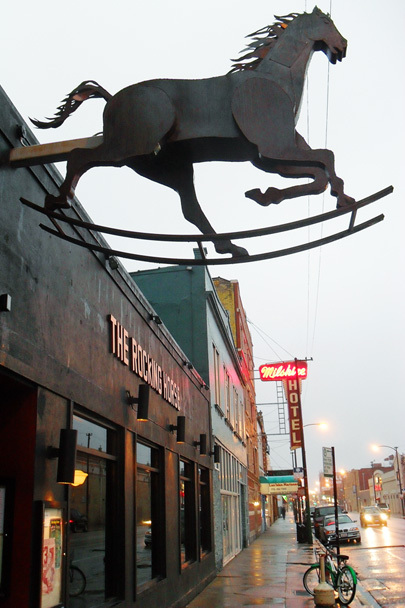 Do you have any other recommendations for restaurants/bars we should try in Logan Square? On Friday, Alyssa and I went on a tour of Chicago Distilling Company in Logan Square. 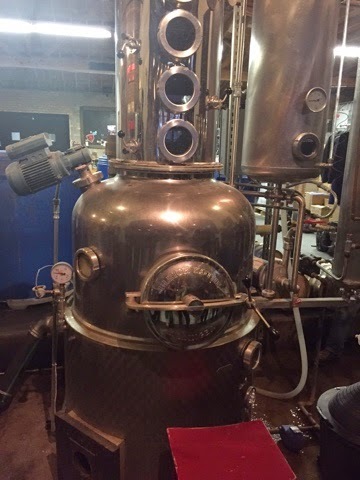 They currently distill white whiskey, gin and vodka and have tours every Thursday through Sunday. Alyssa got us a deal on Gilt City so our tour was $19 for two people and we got a cocktail kit. Normally tours are $10 - and you get a tasting of each of their products. We got there a little early to try out the cocktails. 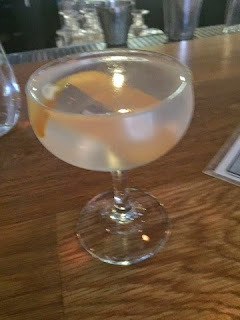 I had the Finn Tini, their gin martini - and it was not my favorite. I'm not the biggest gin fan, but I thought I would try something new. I'm sure it would be a hit, if you like martinis! Alyssa had the Logan Mule, which she enjoyed. Finn Tini - look at that organge peel! The distillery itself is actually fairly small, but it seems like they are a growing operation and may expand soon. 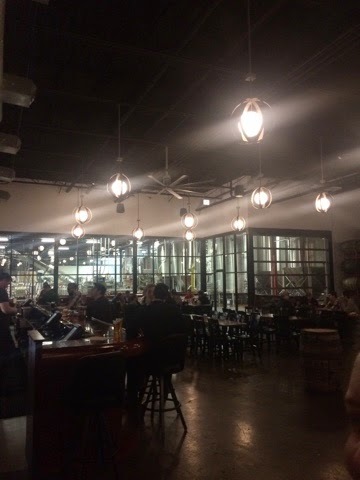 The entire building is split into two: the bar area and then the actually distilling area, which is separated by a window so you can see what's going on. Despite the small distance we had to cover, our tour guide, Christina, was super knowledgeable and gave us a good overview of the history of the distillery and how the spirits are made. Yeasty mixture - actually quite hot! Before this tour, I didn't have a good understanding of how liquor is made, but I have a much better understanding now of how the actual alcohol is extracted and how distillers use different grains to get different types of alcohol. I'd highly recommend the tour if you'd like to learn a little bit more! The tour groups are also kept small, so feel free to ask questions throughout. Like I mentioned before Chicago Distilling Company makes white whiskey, vodka and gin. I love whiskey, but Shorty's White Whiskey was far from what I'm used to drinking. Their whiskey isn't aged at all - they're working on it - so it tasted more like a rubbing alcohol/tequila mixture to me. This is best enjoyed mixed in a cocktail! I thought the Ceres Vodka tasted better than the average vodka on the market and Finn's Gin was quote enjoyable (just not in the martini that I had!). Overall, I really enjoyed my time touring the Chicago Distilling Company. If you're at all interested in visiting, do it soon before they get bigger and too crowded! St. Patrick's Day is over, which means: it is is MARCH MADNESS! Hopefully you've all gotten into the spirit by filling out a bracket and sneaking out at lunch time to catch some games. If you're looking for a fun place to have a few drinks and get something to eat, I'd recommend Old Town Social on North Ave. I went here last week for a post-work dinner with my boyfriend. It is pretty easy to walk to from the Sedgwick Brown Line stop (which is important for me since I am currently injured...). There are a few different areas inside: the large bar area with many televisions behind it, the back area with booths and tables, a front area that seemed more cozy (it has a fireplace!). There are TVs pretty much everywhere and one of the first things I noticed when I walked in: the wall bracket, just ready to be filled with winning teams and upsets (probably at least 9 feet tall?). Obviously this place takes March Madness seriously and will be open early on all game days so that you can get a good viewing spot. They also take reservations, which I'm sure would come in handy this weekend. We knew we wanted burgers and Old Town Social's were YUM. I had the "OTS" burger that comes with bacon, gruyere and a fried egg--the most PERFECT fried egg I've ever seen. The whole burger was great and the truffle fries and cheese curds were wonderful sides. My boyfriend got "The English" burger and would highly recommend it to fans of blue cheese. 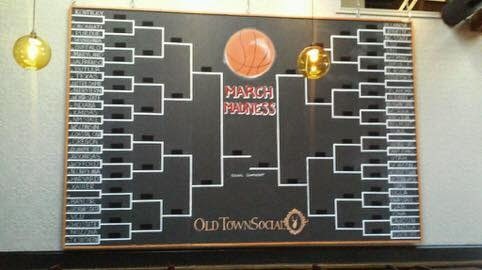 Overall I'd say Old Town Social is chill pub with good food that MAY be trying a little too hard with its ambiance, but I'd definitely go back to watch a game. Did anyone's brackets get totally busted? Any other good recommendations for places to watch THE MADNESS? Are you all spending all weekend glued to the TV or do you ignore the tournament? Let us know in the comments! There are a lot of taco options in this city, but one of the most well-known is Big Star. While Big Star gets a lot of hype, in my opinion it's well-deserved. Not only do they have a delicious and varied assortment of tacos and other Mexican foods, but Big Star also has a solid bar. As a lot of the Mexican places in the city are BYOB, this can be a nice change. A few weeks ago, wanting to find a warm respite in the sub-zero temps, a few of my friends and I decided to meet there for dinner. I've never been to Big Star before on a Friday night, but I was not surprised that it was super crowded and that there was a wait. However, what did surprise me was that we had to wait close to 2 hours for a table! Thankfully, we were able to order chips and guacamole to the barrel we were waiting at - hanger averted. I think part of the reason why it was so crowded, is that Big Star has a huge patio that's open when it's warm out, which probably doubles the amount of people it can seat. I'm hesitant to say that Big Star is good enough to wait 2 hours (especially if starving), but it's definitely worth a wait, especially if you are able to snack on their chips and guacamole, which are quite good. Their tacos are equally delicious. Previously, I had only had the Taco de Papas (potato taco) taco, which I would recommend to even the most devoted carnivores. This time I had the chance to try the chicken and carnitas tacos and I was not disappointed. Big Star also has a great selection of drinks. I really love their margaritas - they are super strong and not too sweet (get the pitcher!). 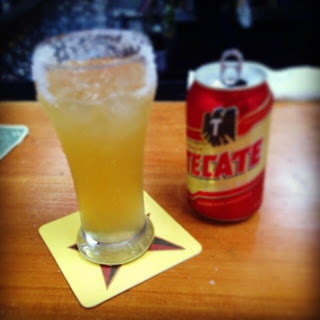 The Cheladas (tecate and lime) are pretty good, as well - although it's hard to compare as I've only had Cheladas here! While I don't really understand the connection with tacos and whiskey - they also have a big selection of the latter. They have different $3 whiskey shots each day of the week, as well as a good selection of whiskey cocktails. If you're thinking of going to Big Star, it's best enjoyed in the warm weather out on their patio - just be prepared to wait! 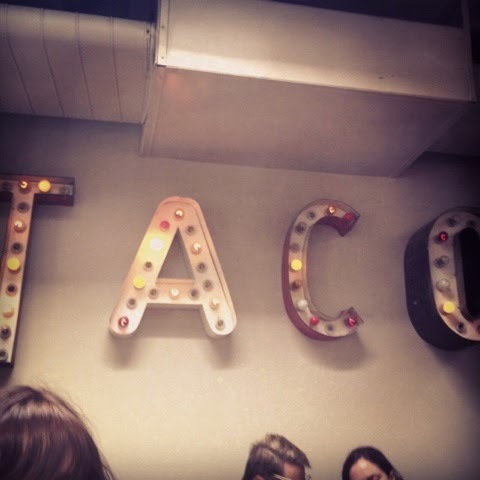 If you have any other taco suggestions, let us know! Though most of the country (especially CHICAGO!) celebrated St. Patrick's Day this past Saturday, the day isn't officially until tomorrow, March 17th, the presumed day of St. Patrick's death. This day is very important in Chicago, and other cities with lots of Irish Catholics. I thought it would be interesting to research more about why this day is so popular, especially since I am ~25% Irish on my dad's side of the family + I went to Notre Dame and Catholic school most of my life, so I know a LOT of Irish Catholics. While the Irish had been celebrating it as a holy feast day, St. Patrick's Day didn't really become a big deal until Irish Catholics started immigrating to the United States in the 1700s. When these immigrants started joining the military they decided that they wanted to start throwing their own parades to celebrate their Irish heritage, and what better way than to do this for St. Patrick's Day? Irish immigrants were persecuted for their Catholic beliefs and Irish traditions, but they were still proud of where they came from, and I think I can say they had the last laugh, since you don't see many people in Chicago NOT wearing green on St. Paddy's Day. At his local pub, St. Patrick got stiffed on a shot of whiskey--it was not as full as it should have been. To teach to the barkeep a lesson, he told him that there was a demon living in the pub's basement. This demon fed on the barkeep's dishonesty and selfishness and that it could only be banished if the barkeep changed his ways and started being more generous and truthful. When St. Patrick next visited the pub, the barkeep asked him if he could check on the demon (presumably after pouring him a tall shot of whiskey). St. Patrick checked the basement and told the barkeep that the demon was starving (since it hadn't been able to feed on dishonesty) and that he would banish it for him. After that St. Patrick said that everyone should have a drop of "the hard stuff" on his feast day. The tradition of green beer actually started in the United States in the early 1900s, when bartenders realized it was pretty easy (green food coloring!) to serve green beer to celebrate St. Patrick's Day. That idea caught on, and you can find green beer at pretty much every bar now during the week surrounding March 17th. They even serve green beer in Ireland now too! So while the majority of Chicago's Irish celebrations may be over (the city parade, the Southside Irish parade, the dyeing of the river, all around day drinking), be sure to have a shot of whiskey or pint of beer tomorrow for St. Patrick. 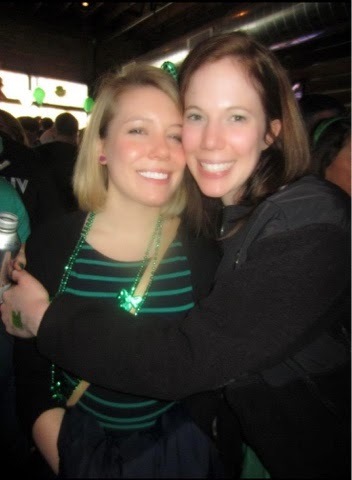 Bars can get SUPER crowded on St. Patrick's Day and, for me, there is nothing worse than being jammed into a bar with hundreds of drunk people. In Chicago, however, we are lucky in that there are bars on almost every corner. If you do decide to go out on St. Patrick's Day, I would recommend going to one of your favorite neighborhood bars. Chances are it will be just as lively, just with a lot less people. Last year we went to one of our old neighborhood favorites, Southport Lanes, and we're lucky in that there was almost no one else there. While I despise all things bowling related, I do love this bar. They always have a great selection of beer and their food is extremely delicious. When we decided to switch it up and head to Justin's, which is more popular we quickly had to leave because it was too packed. An alternative to the crowds is hosting your own party. Must haves for a St. Patrick's Day Party: snacks, green food coloring, lots of beer, ingredients for Irish Car Bombs, friends. Whatever you choose to do on St. Patrick's Day - make sure you drink a lot of water and remember to eat! Over the weekend, I took a trip to my hometown of South Bend to visit my parents. Growing up in that area and then also going to college there, I've pretty much experienced most of the restaurants and bars the city has to offer. 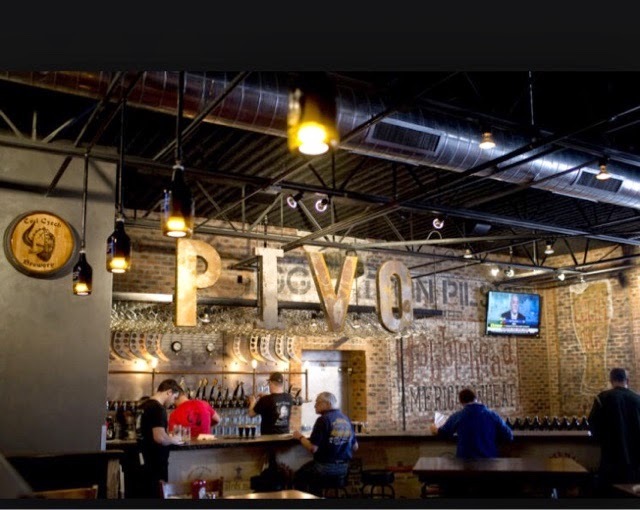 However, over the past few years South Bend has seen many new establishments pop up, one them being Evil Czech Brewery. Evil Czech Brewery (ECB) is located in the building where my dad opened South Bend's first craft brewery/restaurant in the early 90s. While, I was too young to enjoy the beer, I have many fond memories of sitting in the bar eating cheeseburgers and nachos. Mishawaka Brewing Company closed several years ago (my dad was way ahead of the craft beer game),and I was interested to see what the building looked like now. Especially, it has been well over a decade since I'd been inside. Not only did the outside look completely different, but the layout inside had also changed dramatically. Sadly, I did not take any of my own pictures of the inside. We went late Saturday afternoon and the bar was actually super crowded. ECB has an extensive menu - both beer and food. Their beer list is really clever - they listed the beers on playing cards, with the name and ABV/IBU info on the front and a description on the back. At one time, they have around 18 beers on tap - it was hard to choose from all the options! I ended up getting a flight, which comes with 5, 5oz. beers. I chose the White IPA, "White Reaper," the Belgian Dubbel, "John the One Eyed," the Cherry Stout, the American Pale Ale, and the Blonde Ale, "Blonde Czich." My favorites were the Belgian Dubbel and the Cherry Stout, which surprised me because I normally don't like Stouts. The White IPA was probably my least favorite, it somehow managed to taste hoppy and watery at the same time. My boyfriend ordered the Bobblehead American Wheat Ale, which was also a good and you can buy it in cans! The food menu was just as overwhelming, but I ultimately decided on the pork belly corn dogs. As a newbie to meat eating, this was perhaps not my best choice as I didn't realize that the pork belly would contain so much fat (not my favorite! ), but the meaty parts were really good as was the outer cornmeal shell. My boyfriend got the pizza which he said was delicious and my mom ordered the veggie burger, which was also very good. The highlight of the meal for me was the french fries - which were both crispy yet had lots of potato. I really enjoyed my experience at Evil Czech Brewery. While I will probably never eat pork belly again, I will definitely visit next time I'm in town. A couple of weeks ago, my boyfriend and I took a short weekend trip down to Fort Lauderdale to escape the cold and snow of Chicago. The last two days of our trip were glorious: sunny, 80, perfect beach weather. Sadly the first full day was full of rain. I tried to make the best of things by looking for some indoor activities and found Funky Buddha Brewery. After a delicious brunch at Lester's Diner, we drove over to Funky Buddha to try some of their beers. The taproom is very large compared to some of the smaller ones in Chicago, which was a nice change of pace. Dave and I sat at the bar and chatted up the cast of characters that made up the bartenders. We decided we would try all of their 8 "special" beers by ordering 2 flights (4 each), and then we ordered 1 more flight to split in order to try their "standard" beers. The flight holder is in the shape of a Buddha, and the oyster crackers were a nice touch! Since we had arrived early in the afternoon, there wasn't much happening in the taproom, so the bartender was able to talk to us more about the beer. He told us that he pretty much exclusively drinks Funky Buddha's Small Axe, a 10% double IPA. It sounded like only drinking that strong beer may have messed up his palette as he told us he couldn't taste some of the flavors in their other beers like ginger, lemongrass, blood orange, raspberry, habanero, just to name a few. He said Small Axe was the best beer in the land, and when I asked him if he had tried Bell's Hopslam he said it was "garbage compared to Small Axe". While I don't agree with him about that, Small Axe was a pretty good double IPA, although it wasn't as smooth as others I've had. My favorites out of the beers we tried were a pineapple IPA (Pineapple Hop Gun) and a blood orange American IPA (More Moro). They were both fruity without overpowering the taste of the hops. 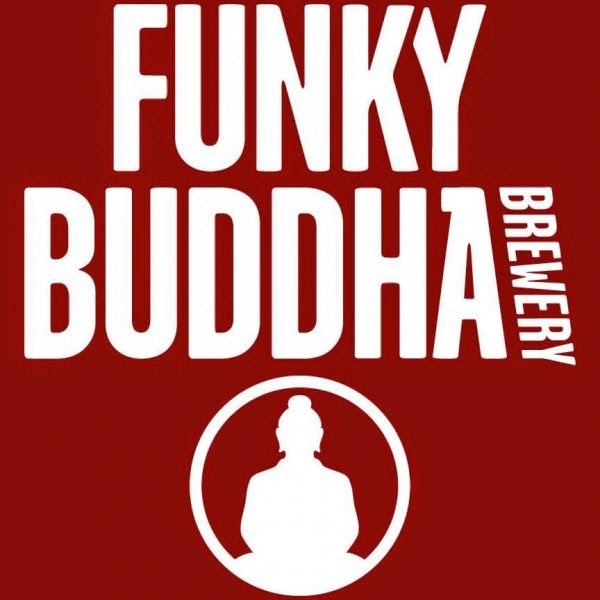 Unfortunately it looks like Funky Buddha is only available in Florida at the moment, but if you're ever visiting, definitely look out for it on tap! For the majority of my adult life I was a vegetarian...until a few months ago when I decided to start eating meat again. Not only did this open up so many more options to eat (and sandwich options at my beloved Potbelly <3), but I can now get a little more creative with my cooking. As a vegetarian, most of my experience cooking with alcohol was limited to risotto (very delicious). However, since starting to eat meat, I have found various ways to incorporate beer or wine into my cooking. Cooking with alcohol can add a really nice flavor and moistness to meat...and you can drink whatever you don't use! My most recent foray into mingling meat and beer was making slow cooker BBQ chicken. It was so tasty that I decided I would share the recipe. I used 1 tbsp Chili Powder, 1 tsp Cumin, a bit of Paprika, some cayenne, some garlic powder and salt. Cover the chicken in the spice mixture and then throw the rest in the pot along with the other ingredients. Put the slow cooker on low for 6-8 hours...and that's it! Once the chicken is done, it easily falls apart with just a fork. It makes about 5-6 servings, depending on how much you eat. In my opinion, the beer adds a nice mild flavor to the chicken - without it the BBQ sauce might be too sweet or tangy. It also kept the chicken from getting too dry and the BBQ sauce from getting too thick. This chicken would taste great on a sandwich, but I was so prepared for this recipe that I forgot to pick up bread...I ate it with a side of homemade mac and cheese - perfect for the frigid temperatures outside! 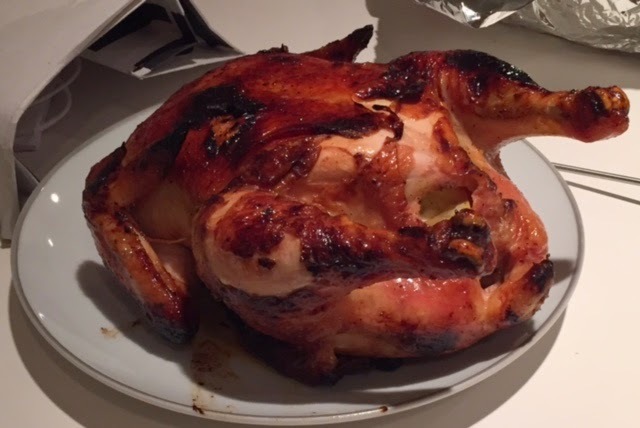 Aside from BBQ chicken, I've also used beer/wine to make chicken tacos and cauliflower tacos, risotto, a whole roasted chicken and pork chops - other recipes that I'm sure I'll be sharing! *One of us has also been too busy watching House of Cards to visit new bars.